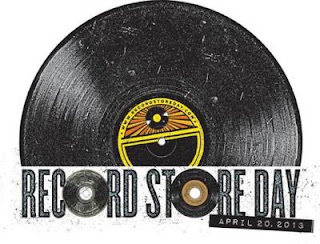 Today is Record Store Day, an annual worldwide independent music extravaganza. By the time you read this, you may already have returned from your outing, records in tow. Equally, you might not have set out - every day is something of a record store day, after all. Either way, here are some of our recommended special releases that have come out on Record Store Day 2013. One of Simon FG's recommendations, and considered a seminal album by many. Track down this vinyl re-release, if you can. Everything Everything returned at the start of the year with 'Arc', the follow-up to their debut album, 'Man Alive'. The second effort is arguably an improvement over the Mercury nominated debut, and 'Duet' is one of the undoubted highlights. Widely considered as one of the best albums of all time to come out in Scotland, 'The Midnight Organ Fight' gets a deserved vinyl re-release. As an added bonus, the package comes with a live version of the album, 'Quietly Now'. One of our favourite singles of the year already, Ghostpoet's mesmerising mix of experimental pop and hip hop is emboldened by the majestic guest vocals of Woodpecker Wooliams. A timeless record - easily recognisable, and highly influential. We're still not sure about the mariachi version on the recent Doritos advert. Safer to stick with the excellent original, which also comes with an extended dance mix and b-side 'Seconds' on this release. Another celebrated record to get a re-release on Record Store Day - hear where it all began for the Scottish outfit. Limited to 1000 copies, the re-issue comes on a paint-splattered vinyl, accompanied by an A3 reproduction of an early gig poster. Nostalgic. Featuring a range of artists from tastemaking label Kissability, including FG faves likes Thumpers and Among Brothers but also fast risers like Deaf Club and Splashh. A terrific intro to the great new music that is out there. A special release for both new and old Suede fans, combining the classic 'Animal Nitrate' with recent free download 'Barriers' on a limited 7" vinyl. Listen to the playlist in the embed above or at YouTube. Head to recordstoreday.co.uk for more details.